Make it easy for your mobile, desktop and tablet visitors to share your content across the web. Also, access specialized analytics and offer up smart content recommendations — all for free. Unlock Shareaholic now. Facebook’s Q4 and Full Year 2013 Earnings report got me thinking: As Facebook usage increases and the company grows mobile ad sales, what does that mean for mobile referrals? Would they increase too? Or suffer for the sake of ad dollars? In October, we released a report which noted Facebook mobile’s share of traffic grew 253% year-over-year (Sept’12-13). * Impressively, mobile contributed a quarter of the social network’s overall referrals to sites. But last month, we discovered share of visits from Facebook mobile among our network of 200,000+ sites reaching more than 250 million unique visitors each month increased 197% since September. Facebook mobile drove 8.25% of the overall visits sites received in January. Indeed, Facebook is very much the “mobile company” everyone suggests it is. This is demonstrated not only by the fact that mobile made up 53% of its advertising revenue in the fourth quarter, but by its commitment to providing a better mobile browsing experience with the introduction of its Paper app. In January, Facebook’s share of visits was 16.21%. Finally, Facebook mobile, with an 8.25% share, accounts for more than half (50.89%) of Facebook referrals. 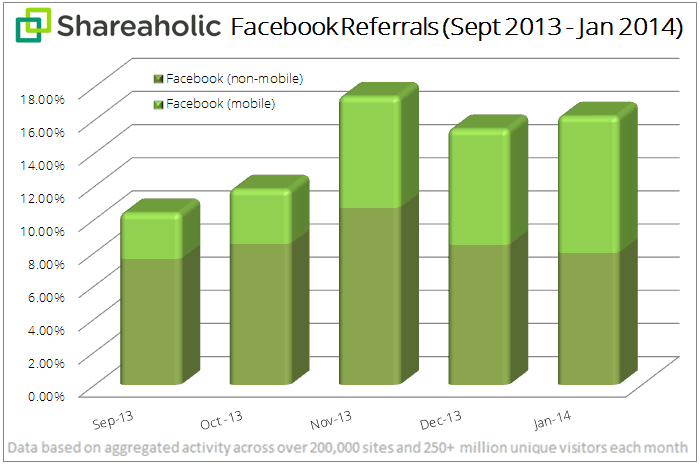 The answer to the question: Would Facebook mobile referrals also increase as the site grows its users and mobile ad sales? YES. Responsive design and mobile site optimization are more important than ever. Earlier this month, Nielsen published a report titled, The Digital Consumer. Revealing growth in mobile usage, it’s hard not to recognize with our obsession with our palm-sized devices. Effectively, if your business or blog isn’t very usable on a mobile phone, you’ll want to invest more resources into building a mobile experience your visitors can’t get enough of — or at least one they won’t hate (gif sourced from geekosystem). How much traffic does your site get from mobile devices? Let’s discuss in the comments! By the way, Shareaholic is hiring! We’d be excited to have you join the team. * Our data is represented as “share of visits”, a percentage of overall traffic — direct traffic, social referrals, organic search, paid search, etc. — sites received, because the volume of visits (and uniques) our publishers receive changes month-to-month. In September, we tracked just over 250mm uniques; last month, we reviewed data for 404mm unique visitors. Visits grew by a comparable clip too. Ultimately, sharing our raw data — hundreds of millions of visits — would not enable site owners to appropriately benchmark their site’s traffic against what sites in our network received.